What is a regulatory disorder? 1. The many facets of eating? 2. What can go wrong? 1. What is obsessive–compulsive disorder? 2. Is there a difference between healthy rituals and obsessive–compulsive behavior? 3. What causes obsessive–compulsive spectrum disorders? 4. How can this disorder be treated? 1. What is sensory integration? 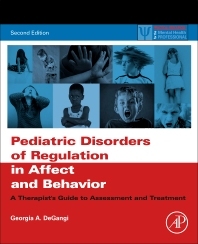 Pediatric Disorders of Regulation in Affect and Behavior, second edition is a skills-based book for mental health professionals working with children experiencing disorders of self-regulation. These children are highly sensitive to stimulation from the environment, emotionally reactive, and have difficulty maintaining an organized and calm state of being. Children with these struggles often have difficulty adapting to changing demands at home and school. The child may additionally struggle with bipolar or mood disorder, anxiety, depression, obsessive–compulsive disorder, Asperger’s syndrome, eating or sleep disorders, and/or attention-deficit disorder. This book will help professionals integrate treatment strategies that address the individual’s regulatory, sensory integration, and mental health problems. The book is organized with each chapter discussing a different form of dysregulation in eating, sleep, mood regulation, anxiety, attention, and behavioral control. Chapters begin with developmental and neurobiological underpinnings of the problem, include clinical observations, and close with diagnosis and treatment strategies. Recommended treatments integrate aspects of dialectical behavioral therapy, mind–body therapies and sensory integration techniques, and interpersonal therapy. Checklists for diagnosis and treatment planning are included at the conclusion of each chapter with an appendix of 20 skill sheets for use in treatment. Georgia DeGangi, Ph.D., OTR, FAOTA, is a clinical psychologist and an occupational therapist. She currently works in private practice at ITS (Integrated Therapy Services) for Children and Families, Inc., in Kensington, Maryland, and has worked at the Reginald S. Lourie Center for Infants and Children in Rockville, Maryland, as the Director of Research for the past ten years. She has over 25 years' experience working with infants, children and their families. She has extensive experience with diagnosis and treatment of a range of developmental, sensory, behavioral, and emotional problems. Dr. DeGangi has conducted research for many years to examine the most effective ways of treating children as well as examining how problems in infancy related to self-regulation, sensory processing, attention, and social interactions develop as children grow older. Among her publications are the Test of Sensory Functions in Infants, the Infant/Toddler Symptom Checklist, and the Test of Attention in Infants. Dr. DeGangi is internationally recognized as a leading expert in the assessment and treatment of sensory processing, attention, and interactional problems in infants and children. She was the 1992 recipient of the A. Jean Ayres award from the American Occupational Therapy Foundation and has been distinguished in the roster of fellows of the American Occupational Therapy Association. She serves on the faculty at the Infant/Child Mental Health program of the Washington School of Psychiatry and is associate editor of the Journal of Learning and Developmental Disorders.